Sheenan, Carol. "Bill Reid". The Canadian Encyclopedia, 07 March 2018, Historica Canada. https://www.thecanadianencyclopedia.ca/en/article/william-ronald-reid. Accessed 21 April 2019. Returning to Vancouver, he became involved with the creation of a monumental sculpture for the University of British Columbia, called Haida Village. Reid eventually became a recognized leading authority on Haida art and life. Haida artist Bill Reid is credited with the revival of Northwest Coast Indian arts (photo by Thomas King). William Ronald Reid, sculptor (b at Victoria 12 Jan 1920; d at Vancouver 13 Mar 1998). An internationally recognized HAIDA artist, Bill Reid is frequently credited with the revival and innovative resurgence of Northwest Coast Indian arts in the contemporary world. Son of a Haida mother and a Scots-American father, Reid was a teenager before he knew of his native heritage. Later in life, while a CBC broadcaster, he studied jewellery and engraving at Ryerson Institute, Toronto (1948), and began investigating the arts of the Haida in 1951. Furthering these studies, he went to the Central School of Art and Design in London, England (1968). 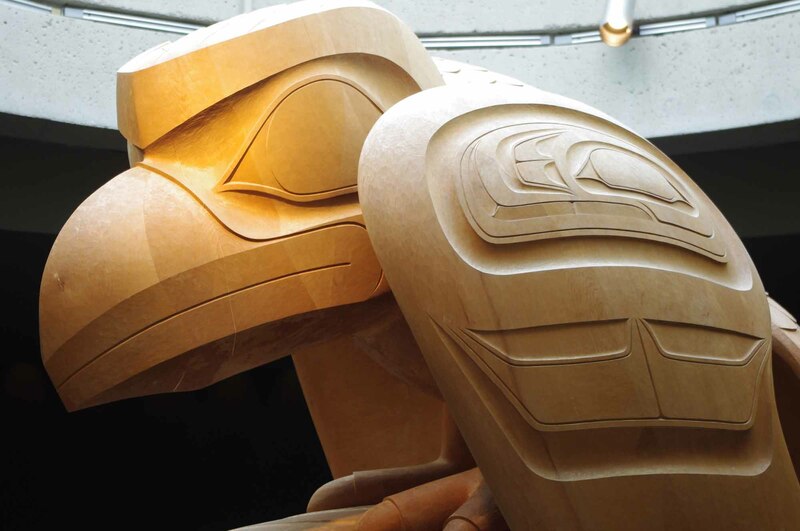 Returning to Vancouver, he became involved with the creation of a monumental sculpture for the University of British Columbia, called Haida Village. Reid eventually became a recognized leading authority on Haida art and life. Accomplished in many media, Reid carved in silver, gold, wood and argillite and cast in bronze. He issued several editions of serigraphs and illustrated and collaborated on many books, including The Raven Steals the Light (1984). Among his major works were the 4.5-ton cedar sculpture Raven and the First Humans in UBC's Museum of Anthropology (1980); a bronze killer whale sculpture, The Chief of the Undersea World, for the Vancouver Aquarium (1984); a canoe commissioned for Expo 86 (1986); and Spirit of Haida Gwaii, commissioned for the Canadian embassy in Washington, DC (1991). 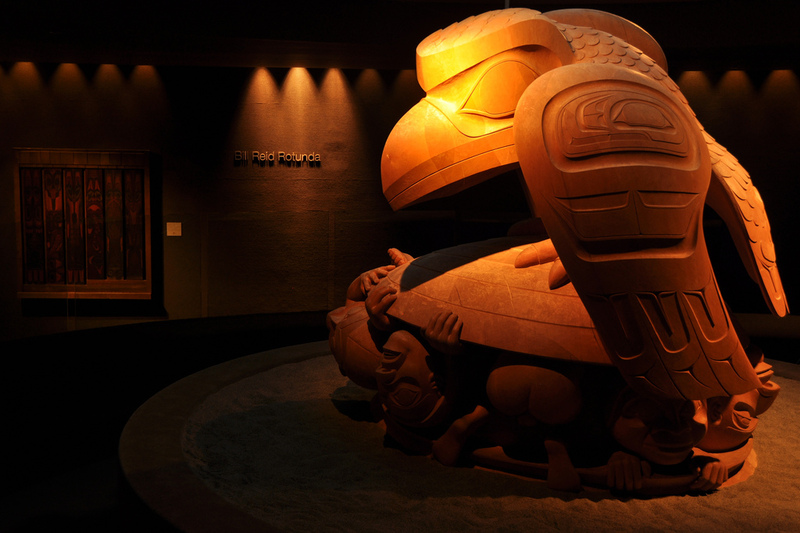 This is a moment in the Bill Reid Rotunda at the Museum of Anthropology, University of British Columbia, that depicts the ancestral past of the Haida people when Raven, a wise and powerful yet mischievous trickster, found the first humans in a clam shell on the beach, and is coaxing them out of it. Bill Reid was awarded an honorary doctorate from UBC in 1976, the Molson Prize in 1977 and the Lifetime Achievement Award, National Aboriginal Achievement Awards, sponsored by the Canadian Native Arts Foundation in 1994. Reid was an eloquent and outspoken proponent of native rights in Canada and was especially active in the battle to preserve the national and cultural history of South Moresby in Haida Gwaii. 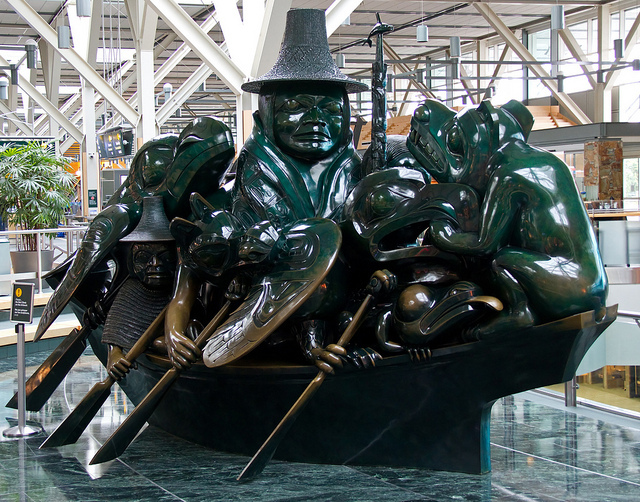 Spirit of Haida Gwaii: The Jade Canoe at the Vancouver International Airport.